The A2BLK A Series Armadillo Speaker (Green) from Bogen Communications is a co-axial speaker system that is excellent for playing music or broadcasting pages. The A2BLK is ideal for use in smaller spaces, indoors and out; the cabinet is fully sealed and weatherproof and is UV-light resistant, enabling the unit to stand up to the harshest conditions. The system features metal alloy MDT (metal diaphragm technology) and MLS (magnetic liquid suspension) for natural sound and ultra-low distortion. In addition, gold-plated, rust proof connectors ensure that the sound you hear comes through as clear and clean as possible. The A2BLK is easy to mount and install with the included color matched aluminum brackets. This co-axial speaker system features gold-plated, rust proof connectors. The A2BLK is an indoor and outdoor system that is weatherproof. 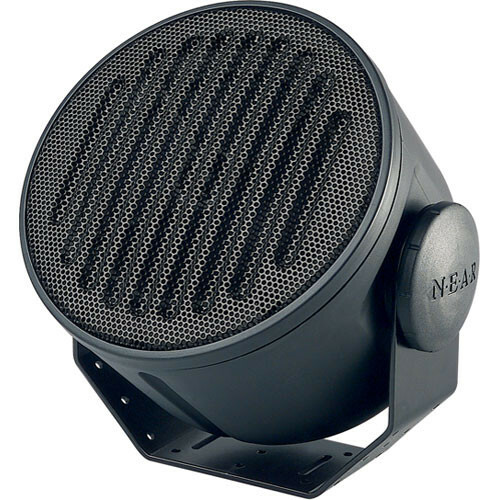 This speaker features a fully sealed high-density, injection molded cabinet that resists chipping and scratching. Box Dimensions (LxWxH) 11.7 x 10.9 x 10.9"